Bruce was born in Newark, NJ Sept. of 1959. His parents relocated to Vermont in 1969 when Bruce was just 10 years old. He quickly developed a passion for shooting Rifles, Pistols and Bows. A self taught hunter, Bruce began hunting whitetail deer at the age of 14, harvesting his first buck at just 16 years old. 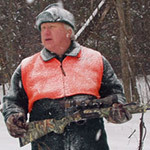 Currently 35 years later he’s still pursuing those elusive whitetail deer along with Turkey, Moose and North American Black Bear. Off season Bruce spends his time with family & friends, scouting, traveling, camping, riding the Quad, amature photography and helping others enter into Vermont’s oldest and most valued tradition. The tradition of hunting. When a deer sees you in the woods, will you be busted or not? Hunters pay extra attention to a deer’s nose and his ability to hear us; but how many hunters fail the test when it comes to understanding how or why deer see us in the woods? My guess is many! Don’t Fret When Hunting Public Lands. We all know the frustrations of dealing with public land hunting. Nobody enjoys being crowded in a hunting spot but it happens and the hunter who scouted well and prepares properly will do just fine hunting public lands.